Verizon's Motorola Droid: Let the Presales Begin! You may not be able to get your hands on Verizon's Motorola Droid for another week, but you can get your name on one starting today. Best Buy opened the doors to the first Droid presale on Thursday -- and it's offering an instant rebate if you sign up, too. The Motorola Droid, officially revealed Wednesday after a buzz-building marketing campaign, is making plenty of waves for its sleek design -- its 3.7-inch, 854-by-480 pixel display dwarfs the iPhone's 3.5-inch, 480-by-320 pixel offering -- as well as for its standout features such as built-in turn-by-turn navigation and full multitasking support. And, thanks to its new Android 2.0 operating system, the phone packs a host of other options the rest of the upcoming Android phones won't see for some time. Already, analysts are calling for the Droid to reverse Verizon's sliding profits and help Motorola rebound from some less-than-stellar years. And, of course, the inevitable iPhone comparisons are cropping up left and right. Regardless of whether the Droid causes the iPhone to "lose its mojo" and go limp, it's clearly drumming up an awful lot of excitement. Best Buy is attempting to cash in on the frenzy by letting you reserve your very own Droid phone now -- without having shell out an extra hundred dollars. 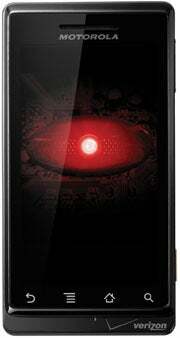 The Droid, you see, actually costs $299.99 (with a two-year contract). You then have to send away a mail-in rebate to get $100 back and reach the frequently quoted $199.99 price tag. As of Thursday, however, you can reserve one at any Best Buy store and pay only the $199.99; the store will instantly apply the $100 rebate at checkout. When the phone comes out on November 6, you'll walk in, pick up your Droid, and walk out. Cost, incidentally, is one Droid-iPhone comparison worth making. BillShrink created a side-by-side chart pitting the Motorola Droid up against the iPhone 3GS. The devices themselves run the same price, but what about those hefty voice and data fees after 24 months of contractually signed service? Turns out they're the same, too. Unlimited voice/data plans for both the iPhone 3GS and the Motorola Droid amount to $3799 over two years, BillShrink discovered. When it comes to an "average plan" -- calculated by BillShrink as being 900 minutes with 5 GB of data and unlimited messaging -- the iPhone and the Droid both come out to the same $2839 over their initial 24-month periods. iDon't know about you, but I'm guessing that's no coincidence. JR Raphael writes geek humor at eSarcasm, where satire never goes out of style. You can keep up with him on Twitter: @jr_raphael.